Perfecting the Golf Swing Plane is often an uphill task for beginners, Thanks to technology, they have best of golf swing analyzers to help them fix the shortcomings of their golf swing and you can do it within the comforts of your home. Golf Swing analyzer provide actionable insights about course correction and tend to be pretty precise. With enough stat-tracking and game analyzers, out there which gives you real time tracking details, we’ve tried to pick the best to help you start losing strokes instantly. There are several features available across several devices such as: scoring, GPS Capabilities and gaming options. Introducing the best Golf Swing Analyzer into your round will be game changing. One of the many great things about the advances that are made in technology is that the items become more personal. When it comes to golf there is now a wide range of self-fitting/self-teaching sensors available which link to applications on your mobile device. These allow you to monitor your personal abilities and can give you suggestions on how to improve. All of this allows for a golfer to efficiently track, analyse and improve all aspects of their games. With this personalised data, it can allow the golfer to improve at their own pace and in their own time. The sensor inside the Zepp 2 offers a wide range of tracking features. With the ability to track several different things at once, the Zepp can record your club and hand plane, tempo, club speed, hand speed, backswing position and generate an overall score out of 100. The overall score is calculated by the presets you entered when you first setup the device. Looking at the traffic light system you will see that red is bad, yellow is average and green is on target/good. With the ability to record video, you can get a more accurate reading and it will also allow you to see exactly where you can improve, whether that’s your stance or your backswing position. The most noticeable change which has come to the Zepp 2 from the previous model, is the size and shape. The bright yellow sensor is now a circular shape compared with the square shape of the previous generation. The key improvements are definitely on the inside, which include another high-speed gyroscope which helps with more accurate data collection and taking down the overall weight of the product to be 6.25g. When it comes to attaching the sensor to your mobile device to use Zepp’s tracking software, the data collected by this device simply blows away the competition. When you get started it is important to set your swinging goals for tempo, back-swing position, club and hand plane and club speed. The presets which come with this device ask a little much of the average golfer. It is more realistic to tone manually bring these settings down which will give you a good starting as you can slowly increase them as your performance increases. Every swing made whilst using the Zepp device is compared to the swing goals you have setup, this will then convert the swing and rate it with a score out of 100. A traffic light system is used and will help identify key areas which needs improvement. When it comes to the performance of the Zepp, they claim that is has a battery life of up to 8 hours from a single charge, which would mean you would get a couple of range sessions in when hitting 100+ balls. If you are using some of the extra features such as the smart coaching or video recording then you may want to keep an eye on the battery life of both the Zepp and your mobile device. The Zepp is a small device which clips onto the top of your golf glove and will track all the essential components of your swing. The Zepp 2 measures 6” x 6” and has a depth of 1.63 Inches, with an overall weight of 6.25g. Comes with a swing-friendly design which will ensure that the device doesn’t get in your way. It is so small and lightweight you would hardly noticed that it was there. Can be used for multiple sports aside from golf. The data is easy to interpret and comes with a traffic light system. Ability to compare your swing with a professional golfer. No instruction manual is available in the packaging, which can lead you to researching information online. The video feature can be difficult to use if you are doing a solo session. The Zepp 2 is definitely one of the best golf sensors available on the market at the current time. According to the zepp golf review, when it comes to design, ease of use and the software capabilities it is simply unrivalled. 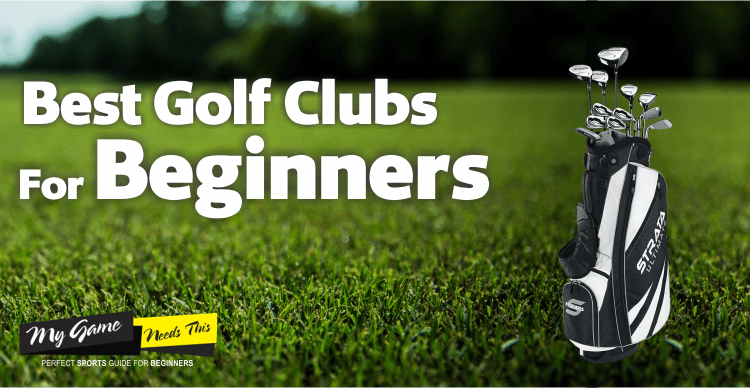 It is a great purchase for beginners and those with are more experienced in the golfing world. With the Epson M-Tracer receiving high praises from some of the industry’s most famous instructors across the globe, it gives the golfer the ability to trust that this product will deliver. One thing to be wary of, even though this sensor has some pretty large endorsements it doesn’t always mean that it will be the right one for you. Fitting to the handle of the club is a simple click system and the device is small enough to be almost unnoticeable when in use. The accuracy and data received from this sensor will help you to improve your golf swing in no time. The Epson M-Tracer uses Epson’s own sensing technology, with the device on your club, the accuracy overall is increased and will be the least of your worries as it can use this technology to give you an accuracy right up to 1/10 of a degree. This kind of data can be extremely helpful as it gives you the closest data you can ever get, which will not only help improve your performance even slightly but will help with coaching also. With a small device the M-Tracer is compact and unnoticeable when it comes to having it attached to your club. With a sleek finish, the device definitely gives the high-end feel. The device is compatible with nearly all IOS and Android devices and boasts an 8 hour battery life. The overall device size is very small coming in at 1” x 0.6” x 2” and weighing a total of 0.95 ounces. There are plenty of ways to monitor your data inside the application which connects to your smart phone. You are able to monitor you clubhead speed, swing speed, lag, grip speed, swing-path and much more. The data which can be interpreted from the application is incredibly extensive. The Epson M-Tracer offers something called HWB View ( Half Way Back ) which is hugely insightful. Offering the ability to see the shaft rotation amount halfway through the backswing cuts out the need to make any other adjustments to your swing. It helps to remove the guess work required to find the issue in your backswing. After one session, you are able to see some significant data which can help you to better improve your swing and put it into action. The M-Tracer measures 2.5” x 1.5” x 5.1” and weighs a total of 27g. Portability and ease of use are a big talking point of the M-Tracer, with it being compact and lightweight. The analyser fastens securely onto the grip and will not affect any part of your swing. The Epson M-Tracer is one of the most accurate devices available on the market and is able to show data within a tenth of a degree. Can provide you with real-time data which can help you to know what you are doing right and wrong at the current time. Whether you are practicing on the driving range or you are out golfing with your friends. The advanced technology which is offered inside this device will help to provide you with information which can help to improve your swing dramatically. The price of this device is on the high end of the scale, with many other devices offering similar features at half the price. However, the M-Tracer will offer value which can be matched to very few others, making it well worth the money. If you are struggling with your golf swing and are looking to improve your performance considerably, then it would be a good idea to purchase this sensor. It is durable and reliable, with the ability to provide you with extremely accurate data to help improve you overall game. Although most people when looking to improve their game go for a coach, the M-Tracer can be just as effective if not more so than a coach. The price tag of the device may be a little high, but it is definitely worth the investment to take your swing to the next level. 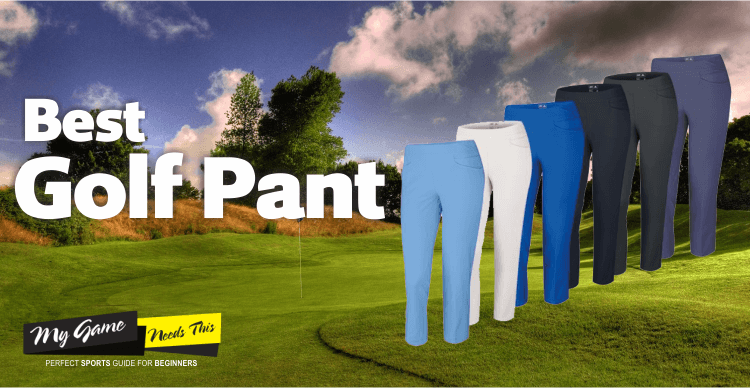 Golf wearables have become a big thing in the industry recently and they have become a regular purchase for both the beginner golfers and the more experienced. With the producing company being the leader in motion capture and analysis technology, their continued production and development of motion sensor technology in sport is what makes them the best. The Blast Golf Swing Stroke Analyzer is there to help golfers by detecting their movements in their golf swing and analyse it which will give an indication of their performance in various metrics. Having a good swing trainer at home is the ideal thing for any golfer who is looking to improve their swing. 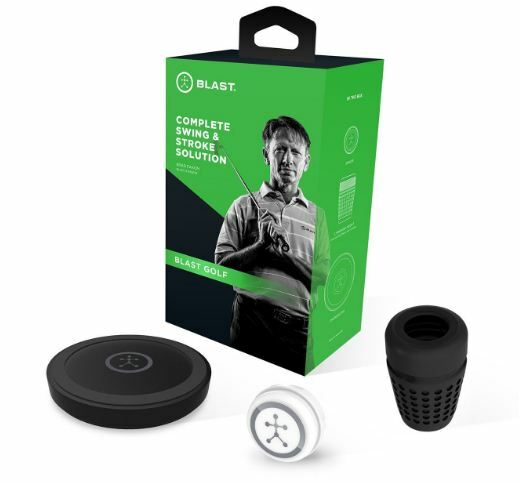 The Blast Golf Analyzer is a 3D motion sensor which attaches to the base of your club with a rubber grip attachment which comes supplied in the box. It uses Bluetooth to help it pair with your smart phone or tablet and pass the data is has recorded into the app which can be downloaded from the Google Play Store or Apple Store. It can be used with any club you have in your bag, although if you are an android user there is a restriction which will only allow the driver and the putter to be used. Once the device is connected, the sensor will begin to record the metrics automatically and in real time. The product comes with the sensor and two rubber grips, one for standard grips and an oversized grip for use with putter grips. The packaging it comes in is of a high quality and even without the outer display cover, the white box interior is made of a strong cardboard. 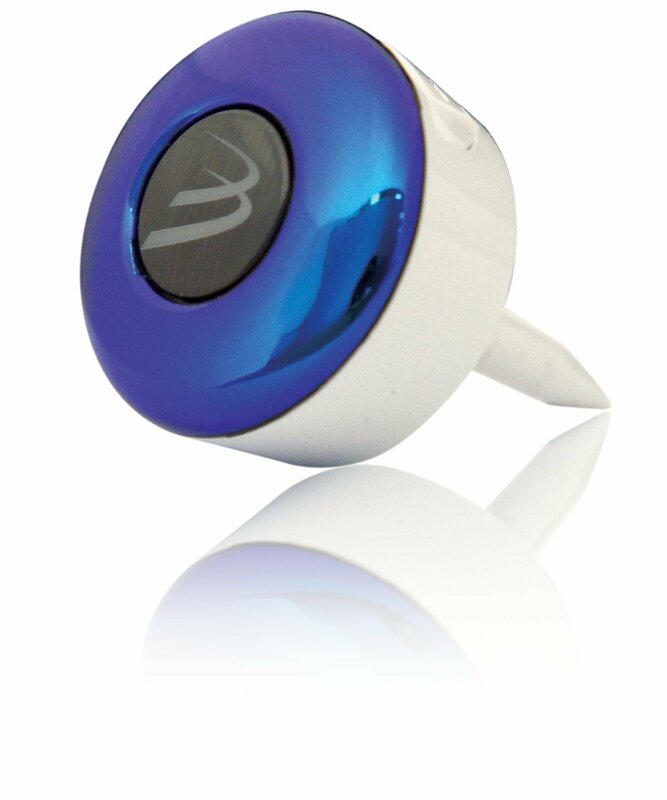 The connection between the sensor and your smartphone is done through Bluetooth, this allows you to be able to view your data in real time and make adjustments which will help you to improve your swing in just a few seconds. With the sensor coming with 2 presets preloaded in, you can hook up the sensor to your smartphone and have it ready to go in just a few seconds. The Blast Golf is pretty much a plug and play device, with the ability to use it straight out of the box. The first step is to ensure that the sensor has a full charge before you begin and getting the app downloaded onto your device ready for pairing. There are two presets which can preloaded on the device which are for the driver and the putter, but if you are wanting to receive the most accurate data from the device then it would be recommended that you setup custom clubs with their own measurements. The Blast Golf Analyzer measures 6.9” x 4.2” x 2.8” and weighs a total of 12.8 ounces. Easily attaches to the end of all clubs, whether that’s a driver or a putter. Bluetooth within the device allows you to pair easily with your smart phone or tablet. It works dynamically to detect motion, that way everything is done automatically for you, which will mean you will never miss a swing. Made from a splash proof material, which will give continued usage even in wetter conditions. Due to the huge amount of features on this device there are very few problems with this device, the only drawback for some beginner golfers would be the price tag. The Blast Motion Golf Swing Analyzer is trusted by a huge amount of professional players and coaches. It has been used in the PGA, LGPA and other respected championships around the globe. If a professional golfer can place their trust in it then it would be greatly beneficial to another golfer who is starting out. Many golfers use a swing analyser to better improve their game performance and help them to get the maximum out of their swing. The Swingtalk offers voice feedback, which is without a doubt one of the great features to be placed into this best swing analyser. With the huge amount of features available and the performance provided during a golf round mean that it is an excellent choice for those beginning their golf journey. Not only this but with the real time voice feedback, it can help you to improve your game mid swing, giving unparalleled performance than any other device available on the market. The sensor inside the SwingTalk allows for extensive data to be received to their intuitive app. Once you have tested a club it will automatically tracks the data for you to review later on. If, for example, you were at the range and you logged 12 different driver swings, once you went back into the app you can select “My Statistics” and look up the date you want to view. There are a few things which are shown here such as: session number, club selected, swing temp and swing speed. You are also able to access by selecting the club and allowing the sensor to show the current active club. The device is fitted to your club grip, simply by adding it to the top of your club with the attachments provided in the box. The rounded shape helps to make it fit perfectly to any club you may have and with an overall weight of 0.37 ounces it can hardly be felt during your swing. Its overall size of 1.26” x 0.52” means that it won’t be intrusive whilst recording your swing data, helping it to keep the club speed and player swing as true as possible. As an added design feature, the Swingtalk is available in both black and white, which means you can select which color would look amazing on your golf club. The worry with a lot of these golf analyzers is the complicated setup process and reading the data can be seem like a heavy chore. But, the Swingtalk is super simple to use, they have removed anything that could make the device seem cumbersome to use. Firstly, attaching the device to the handle of your top flight golf club is a simple click and snap process. Then, all you need to do is ensure that your Bluetooth is enabled on your smart phone or tablet and select the sensor from the list of devices. Once you have done that, simply open the SwingTalk app and you are good to go! There are a few initial steps required to get the app up and running but once you are through them, the sensor sends data to the app automatically. 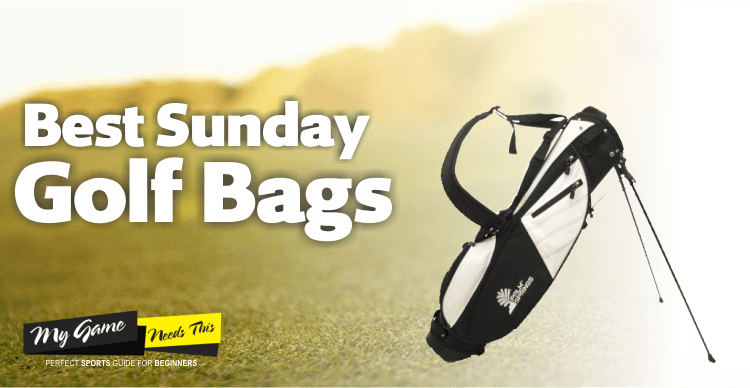 When looking at the product you can tell that it has been designed by GolfZon, who are a reliable company which are able to provide a high quality look for each and every item they produce. They have been responsible for producing innovative products for golfers which aim to help them improve their game. The swingtalk is yet another fine example of what they are able to accomplish with its 3D swing analysis feature, it can ensure the most accurate of data readings. Connecting to your smart phone or tablet using Bluetooth, you can view the real time data this device outputs, which will help you to improve whilst playing. The Blast Golf Analyzer weighs a total of 41g. Swingtalk can provide a lot more information about your swing than any other sensor available. The sleek design and color options can make your club look more stylish and attractive. It is highly accurate, which means you can rely heavily on the data it outputs. It is made of a durable material which means it can withstand vigorous training. The high price tag can be off putting, especially for those who are new to the whole golfing scene. The short battery life can be limiting and can sometimes cause the device to have some Bluetooth connectivity issues. Ensuring that your swing is the best it could be is the only way that you can become a successful golfer. If you are wanting to improve yours then it would be highly recommended to purchase a good sensor which will output the data you need to improve. Although this product has a few problems, it is highly recommended by most professional golfers. Collecting data on everything has become an obsession for people in this day and age. Which is why a golf analyser has become to be the go to gadget when it comes to improving your swing and golf game. 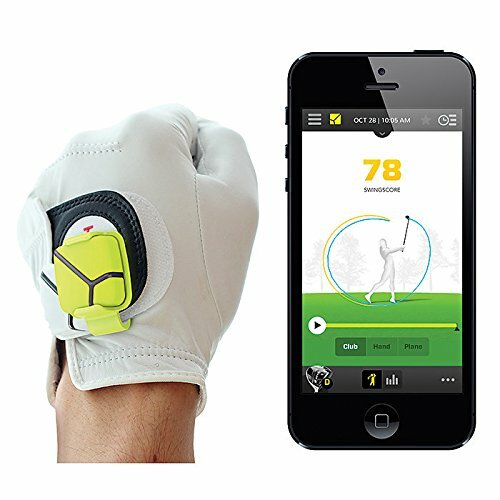 The Golfsense 3D Golf Swing Analyzer is a small rounded device which straps onto your glove and collects information about your swing and speed, sending the recorded data to your IOS Device. Collecting data about everything has become the in thing now that technology has become to advanced. The Golfsense 3D Swing Analyzer is an example of something that collects data really well. 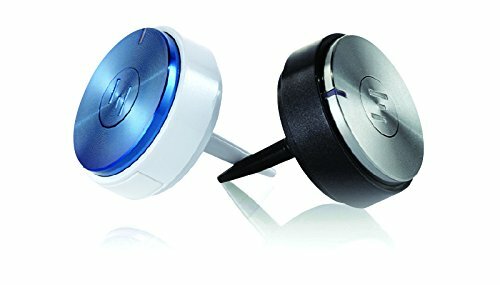 The sensor connects to your iPhone easily through Bluetooth and can be setup in a matter of minutes. It is simple a plastic pebble which straps onto your golf glove and allows you to start tracking data from the minute you place it on there. The overall design of the sensor makes it ideal for anyone who wants something streamlined and that won’t get in their way. Weighing in at just 17g it also means that it won’t feel weight whilst in use and it certainly won’t feel like you have anything slowing you down. With a very simple and sleek design, the pebble like sensor doesn’t seem to be of a low quality, having a single button on the top which is perfect, as many other sensors on the market come with several buttons and this can become confusing over time. Connecting the sensor to your iPhone couldn’t get any simpler, with the device using Bluetooth, you can have it paired within a few minutes and get the app collecting data. It sends all the data is collects in real time which means you don’t have to wait long periods for the data to sync. You can access all this data through the app which accompanies the sensor. It uses the speed and direction to build out a 3D path of your swing, which you can rotate and zoom in on to see where you are under performing. This 3D path can help show you how well you managed your back swing compared to your down swing. The overall performance of this device is good all round. It captures a wide range of data which is displayed clearly in the accompanying app. This means you don’t have to navigate through a lot of menus to see the data you want and also means that you can view all your data on one dashboard without it looking cluttered. 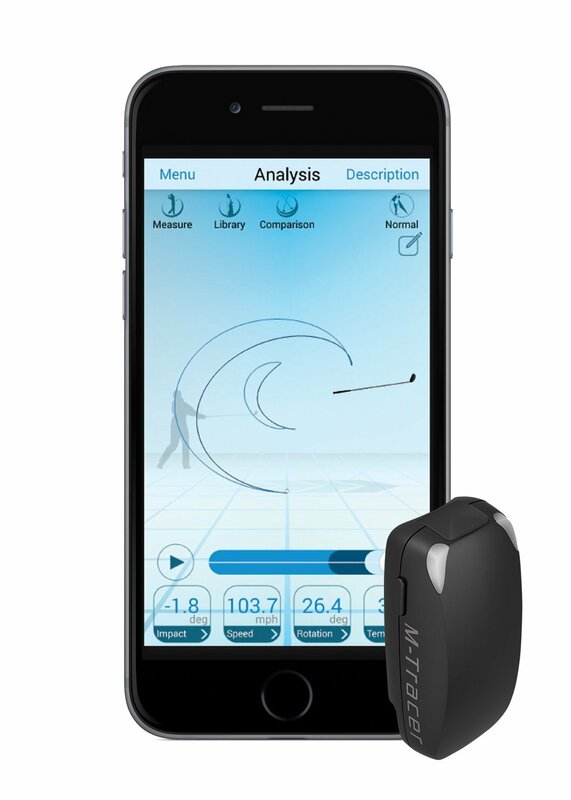 The 3D aspect of this device makes it unique to the market, it helps to give you a clearer insight into your swing, with clear and concise data to support this. The Golfsense 3D Golf Swing Analyzer weighs in at 17g meaning it doesn’t get in the way of your swing or affect your performance. With a pebbled streamline shape it is easy and small enough to wear comfortably. Accurate 3D swing analysis, great to see where exactly you need to improve on your swing. Good app accompaniment for IOS devices. Lightweight sensor means that it won’t affect your performance and you won’t notice it whilst wearing it. Having to manually select a club for each shot can become annoying. Good to be used whilst being coached by a professional as they can interpret the data a lot better. Battery life is poor and will require either constant changing or charging of the batteries. One of the most disappointing things about the Golfsense 3D Golf Swing Analyzer is that it really does drain your smart phone’s battery life, so much so that it will probably require a self-charging case or battery bank to maintain the battery drain of the sensor. Although the sensor comes with a high price tag, if you are serious about improving your swing and your golf game, then it is definitely worth the investment. Which Is The Best Golf Swing Analyzer? When looking into improving your golf swing, a golf swing lesson may spring into your mind, but there are more parts of your game where you could benefit from improvement. With golf hints available in everyplace and with every golfer wanting to shoot a low score, it is essential to have the right equipment which can help to keep track of your personal data. However, many golfers keep the same handicap for a long period of time. Many golfers believe that playing golf more regularly they will improve their game, but it in fact does very little to enhance their performance. 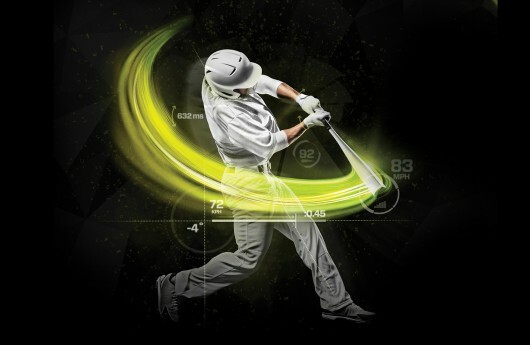 Why Should You Use A Swing Analyzer? So you are probably wondering, why should I use a golf swing analyser? Well, due to the tracking features and the top training guides available at your fingertips you can’t get any better. The dashboards are clear and easy to read, not to mention that they are extremely well built. Using a golf swing analyser will help you to see results quicker than you can imagine, just by following the recommendations given by the app. Whether it’s a better posture you need to aim for or simply finding the right way to grasp your club, this device will certainly help you to achieve that. Starting with Bluetooth technology, the device uses this to connect to your mobile device and share the data between the sensor and the accompanying app. The major part of any golf swing analyser is the gyroscope. This is what measures you swing and provides the data which will help you to improve your overall game. The gyroscope works by having impossibly tiny parts which move very slightly to measure things such as angle, speed and force. By having a constantly vibrating mass attached to this, which will measure something known as “Coriolis effect”, this can sense the device’s direction and quantify the rotational movement of the sensor. The faster the swing, the longer the drive on the ball. This is why having the data from your swing is so important, this is one of the most vital parts of the device if you are looking to increase your drive. The speed of your swing is measured by the device using g-force, this is a measurement of acceleration felt through weight. There are two sensors inside the device, help to improve accuracy and helps to better track how fast your club head and hands are travelling. As well as the direction of the swing. It is important to do you research before buying a golf swing analyser. The reason for this is that they all have a wide range of features and are used for different levels of golfers. Some track different data and others output this data in different ways. Many sensors call the same data different names, so it is important to know this when comparing devices. Make sure you know what data you are looking to have the sensor record and always look at a wide range of analyzers before making your final decision. There are a huge amount of data points that you should be recording and swing speed is definitely one of them. Tracking swing speed can help you to make sure that you get the maximum power out of each swing. Swing speed can be affected in a number of ways, but tracking this can ensure that when improving other aspects of your swing it is either increasing your swing speed and if not then you will see your swing speed decreasing. Tracking hitches in your swing is a massive step to improve your performance. Having a device with the capability to track every aspect of your swing and tell you exactly which points you are doing something that isn’t usually seen is great for improving your swing overall. Swing hitches can be overlooked and many people don’t even realize they are doing them, even those who have had years of playing. With swing tempo, tracking can be a great thing to have. The reason is that it is one of the most overlooked keys when it comes to having a great golf swing. Many people have been through years of training and have still not mastered their swing. This is usually down to their swing tempo, which is why it is essential for you to make sure that your swing analyzer has it. Having data about your swing path can help to you if you are performing your swing in the most efficient way. Having a good swing path can dramatically increase your performance, increasing the distance that you can drive a ball and the speed of your swing. This is one of the most important things to have tracked and many people don’t realize that the path they are swinging is incorrect, causing them to fall into a routine with their swing and never make any improvements overall. Looking for a sensor that will provide you with the data of the face angle at impact. The reason for this is that you can get a better idea of the amount of lift that you are placing on the ball and the best way to improve this angle. Of course, without knowing this information you would be unable to make significant improvements to the height of your drive, the reason why this is so important is so that you can increase the range of your drive. Making sure that you device tracks your back-swing position is hugely important, the reason behind this is because you want to make sure that every part of your swing is monitored. Your back swing is where most of the power comes from in your swing, so making sure that you can make a high number of improvements in this area is essential. Like the back-swing position, it is important that you have a sensor that can track your attack angle, this will help you to measure the angle that you are attacking the ball to help improve how much power the ball receives from your swing. Making sure that this angle is perfect will increase your swing dramatically. Measuring hip movement helps to improve many things about your swing, have the right hip movement can help to increase your swing speed as well as increasing your swing path. Having a swing analyzer that has the ability to track this will help to improve the other aspects of your swing a lot easier. Making sure that you analyzer is accurate is a good start. The greater the overall accuracy of the device means that you can see more areas and at greater detail. This information is necessary to help improve your swing, so the greater accuracy your device has the better it will help in your overall game. This should be on your priority list when looking over devices as you can ensure that the device you purchase will have the right accuracy for the data you are looking for it to track. Of course, one of the greatest things about having a golf swing analyser is the convenience of being able to record data in real time and make improvements right away. Having to wait for a coach sometimes can be hard work and you may not feel like you are making much of an improvement in your game with the sessions being so far apart. Having a swing analyzer means you can hit up the range and change your game between your coaching sessions, accelerating your overall improvement. Golf swing analyzers which perform well should always improve your performance and not affect your game in any way. A certain way to ensure that this doesn’t happen is to have a golf swing analyzer that connects in a suitable location for you. There are a wide range of attachment options available and you should make sure that you select one that you know won’t affect your play. This way you can have a great performing device and have a great game without being affected. Having the ability to share data not only with your friends but with your coach also, helps to keep up the competitiveness which will drive you to improve your game. You can even set goals which your friends can help you keep and you can compare each other’s game, giving advice on areas where you are strong and they are weaker. Sharing data with your coach will help them to provide you with great pointers which can help them to help you improve your game dramatically in a smaller period of time. Many of the devices on the market now offer 3D recording and graphics which will help to see a 3D figure of your golf swing. The reason why this is such a good thing to have is that it will give you a visual analysis rather than just seeing numbers on a screen which can be hard for some people to see exactly how much they need to decrease or increase the angle of their swing. Having the 3D model there for reference means that you can see the line each and every time you hit a ball, as it will show you previous swings to help see where you are improving also. Most of the devices connect using Bluetooth, but the apps are not always developed for your smartphones operating system. Some are only compatible with IOS devices which if you are an Android user it will bring down your options dramatically. The only problem with this is that some devices may have more features than others, but they may not be compatible with your device. This is an important part of your research as if you purchase a device which isn’t compatible then it will cause you having to spend more time returning and doing some more research to find a compatible device. When looking at a golf swing analyzer, you are wanting a device that will last long and under stressful conditions. This is why it is important that you take into account the build quality of the device overall. Having something that is built using flimsy plastic that will break after a few uses isn’t something you should be looking for. Many of the cheaper devices will be built in a cost effective way to help provide the device at a cheaper price. Weight is also a major factor, as a device which has a heavy weight can start to affect your game and performance. Look for a device which is lightweight and won’t interfere with your play. Everyone likes to see the value for money when purchasing anything. Looking at what the device offers in terms of data recordings, the build quality and the sensor technology will help you to make an informed choice about which type of device you want to go for. Of course, setting a budget is important but you want to make sure that you are receiving the most out of the money you are paying for the device. Researching about the sensor technology is always a good step as it will allow for you to see that time and effort has been put into the device by the manufacturer. Sensor technology used in these devices can range depending on the manufacturer as many have spent time to develop their technologies and have their own systems that they have produced to have their devices work how they want them to. A golf swing analyzer which performs well, will record all of the data and keep track of your progress. All of the data is stores will help you to slowly improve your overall swing. The most important data to make sure that your analyzer tracks is of course: tempo, speed, face angle at impact and swing path. Without these basic data points it can be hard to see area which need improving. The more types of data that it can track the more efficient the device will be overall. Taking a look over reviews left on the product can give you a good indication about what the product is about and how others have found it. This helps give you an insight to whether the product is right for you. But more importantly, it is good to do some solid research and read through more than just a few reviews. Don’t forget that these reviews are written by people and they are based upon their opinion of the product. When it comes to purchasing the a good golf swing analyzer there is a massive amount of them on the market. The prices can range from high to low end. The main deciding factor is what you have set aside budget wise for the device and often price plays a big part in your selection process. You should always stick to your budget and find a device which works well for you as well as being within your set price range. How Should You Use The Golf Swing Tracker? 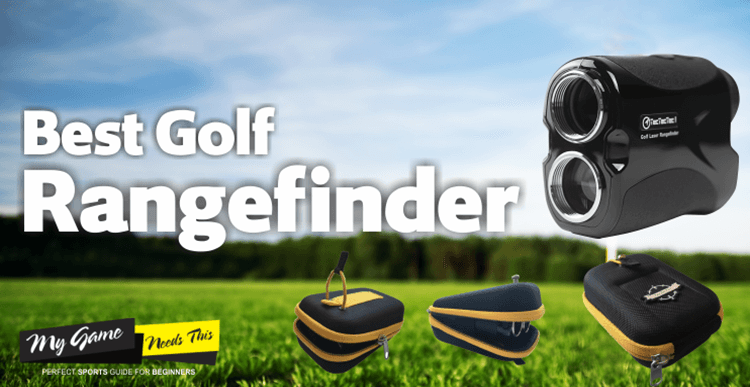 If you are fed up with being stuck at the same level and handicap whilst playing with your friends, getting a golf swing analyzer is definitely a good idea for you. The reasons that these golf analyzers work so well is that they provide a good amount of data to give you an idea of where you are currently and the right ways you can improve. Those who have made it into the professional field have done so through constant practice and have dedicated a huge amount of time to practice which has helped them to improve their game to a professional level. For many average golfers they go to the range and start hitting balls which your first ball may drive 300 yards and the next may skip along the ground, stopping after 100 yards. There is no consistency in the technique, using a swing analyzer will allow you to become more consistent in hitting the ball long distances each and every time. It also helps you to ask yourself question before hitting the ball. These questions may be: Are my hands in the correct position? Is my posture correct? Etc. Like any other sport today, you need to learn your strengths and weaknesses. Is it that you can hit a ball a long way or is it that you have the perfect angle? By using the right golf swing analyzer you can work on your strengths as well as your weaknesses. Of course, don’t try to be like tiger woods from the start, but constantly practicing can help improve your golf swing overall. If at all possible, it is essential that you can practice in all kinds of weather. Working on your back swing, you should utilize your arms to generate power for the rear swing. Many beginners use their hands when generating this force which often leads to difficulties. Another great feature behind having a golf swing analyser is that you can see a huge range of detailed data. It can give you specifics about the swing speed, the backswing angle and much more. This data is essential to know, the reason for this is that it shows you the areas where you need to improve and what your strengths already are. Having something that can tell you exactly your areas of weakness with a high accuracy can help you as well as your coach, as the coach will be able to use the data to change their coaching style to better meet your weaknesses. If you are looking to improve your golf game, then it is not a good idea to never track any data and guess how to improve. This will not only cause issues as you won’t know which area to improve on, but you also won’t know how much you need to improve by. Having the golf swing analyzer helps to negate that issue by tracking data about individual sections of your swing, meaning you can view exactly where you are going wrong and by how much you need to improve. This meaning you will progress much quicker in your game than you would by simply doing the same things over and over again. When it comes to the efficiency of a golf swing analyser, it all depends on how easy the device is to use. If you are having trouble setting up or attaching the device is can be incredibly frustrating, not to mention that it will be extremely inefficient and will not be able to reach its full potential. A good swing analyser should have few very buttons to press in order to get started and most importantly should be plug and play which means that once you attach it to your club or glove everything else should be automatically completed. With the accompanying apps which go along with most golf swing analyzers, there are features on these apps which will allow you to share data with your friends on social media. This means that you can make bigger and better improvements on your game due to the fact that you are sharing your data with your friends. Creating a small competition to see who has improved the most of the week/month can help you to maintain your love of the game as well as make larger improvements as you will be wanting to do better than your friends. Now that technology is playing a significant part in everyone’s life, it is important that you make the most of it to improve your game. With the ability to attach a small device to your club or glove to monitor your swing and help improve your performance without the need of a professional coach. Being able to link the device up to your smartphone or tablet means that you can analyse the data in real time and make quick, significant improvements to your game almost immediately. 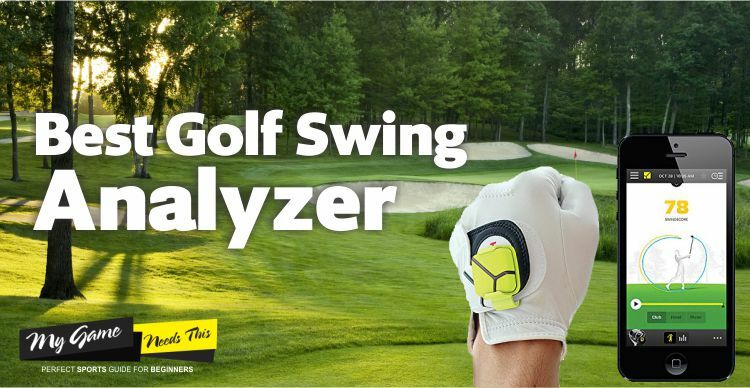 To enjoy all of these advantages, it is important that you choose the best golf swing analyzer for you and with a wide range available on the market, it is important that you spend time deciding exactly what data you would like to monitor and most importantly your budget.